Disassociated ramblings on code and whatever else crosses my mind. This is a new blog. Just a few posts, but we thought we would see how we are looking in a textual visualization sort of way. 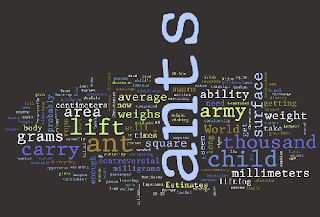 Ants seem to feature rather prominently. Perhaps it is a theme we will run with going forward. Courtesy of Wordle. And you can see it in larger format here. I am a human machine.